Stylish and practical, ideal for the centre of your room the Ashmore coffee table brings with it a hint of elegance. 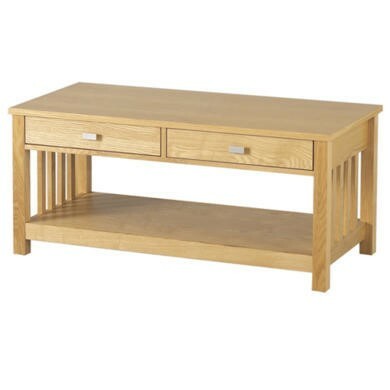 The Ashmore coffee table offers great central storage in your living room. The rectangular top is smooth and spacious perfect for cups of tea. There are two drawers which are ideal for living room clutter or items you need easy reach to. The open shelf at the bottom is spacious and convenient, perfect for storing TV remotes, magazines or books. This table is finished with a light ash veneer giving it great versatility. The sides of the table have slatted detailing which enhances the elegant style. Constructed from a strong wood combination and finished with an ash veneer the Ashmore table is strong and sturdy. The drawer bases are strong MDF with metal drawer runners for a smooth open. The contemporary handles are also metal. It’s very simple to look after your new Ashmore table. A simple wipe over with a duster or dry cloth will keep your surface dust free. For trickier marks try a warm damp cloth before resorting to harsh chemical cleaners. The Ashmore tables are delivered flat packed, self-assembly is required however it is quite minimal. Accompanied with easy to follow step by step instructions assembly shouldn’t be too difficult or time consuming. You will need to provide your own tools.